Mix all ingredients except Sausages, Leek, Frozen Green Beans, Diced Tomatoes, Beer, and the Olive Oil and Liquid Smoke you'll want for Cooking. Cover and cook on the Low setting for 8 to 10 hours, until Beans are tender. You'll want to stir occasionally. Then, stir in Leek, Frozen Green Beans and Diced Tomatoes. Cover and start cooking your Sausages. Mix all ingredients except Sausages, Leek, Frozen Green Beans, Diced Tomatoes, Beer, and the Olive Oil and Liquid Smoke you'll want for Cooking. Cover and cook on a medium heat for 6 - 8 hours, until Beans are tender. You'll want to stir occasionally. Then, stir in Leek, Frozen Green Beans and Diced Tomatoes. Cover and start cooking your Sausages. In your hunky cast iron skillet, heat 2 Tablespoons of Olive Oil, Beer, and a dash of Liquid Smoke at a medium heat. Slice your sausages into coins and toss in the skillet once the Oil is warm. Brown your Sausage until the Beer has cooked off and edges are crispy. To serve, fill your soup bowl and then drop 3-4 coins of Sausage into each serving and sprinkle some French Fried Onions over the top. WOW! This soup looks amazing! 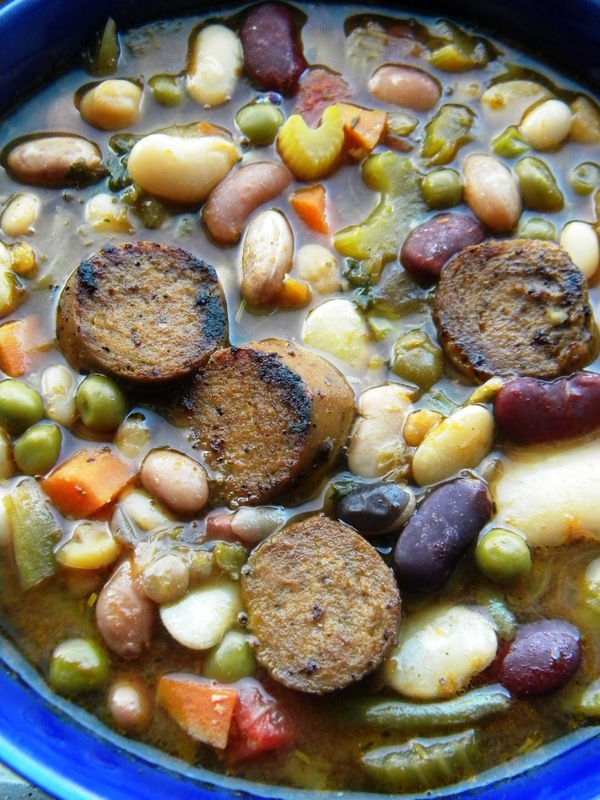 I love the variety of beans and lots of different veggies in the soup, plus the Tofurky Kielbasa gives it a special touch. It looks like a very nice, savory dinner. I am sure that this would fill me up quickly. I love cooking with beer, it it a great addition to soups and stews. Yeah those are links to other vegan recipes in our blog. The titles don't always say "vegan" in them but every recipe is 100% vegan - even though they look like they are "meaty". I like werewolves. Especially when the wolves are quadruped "real" wolf werewolves. :) More human form werewolves are okay but I HATE when they don't give them tails(!!!!!!) I mean, honestly and truly hate it. What, their spines can stretch, pelvises shift, FACES form muzzles but they don't get a tail? I'm sorry, furry human butts just look stupid (Van Helsing, I'm looking at you. Also, Underworld. And... well, ALL of the movies I can think of currently. But especially Van Helsing). Tails, please. Sheesh. What a great sounding/looking soup. I love the idea of using a slow cooker. The thought of walking in from work and my dinner being ready sounds wonderful! I can't wait to try this. I made this on Friday, but I only had 1 hour until dinner (expert planning!) so I used my pressure cooker to cook the beans. I used bob's red mill 13 bean soup mix - no seasoning packet. I added more creole seasoning. It came out amazing and thick, kind of like a stew. Thanks for the recipe! Just made this soup, didn't have leeks so I added a chopped shallot and a scallion when I added the tomatoes. I soaked my beans over night and cooked this on the stove top this morning in about 1 1/2 - 2 hours. It is delicious! Thanks for an awesome, filling soup.